It was one of those wrong place at the wrong time type of deals,” Clint Shults says. On a snowy morning in April 2016, Shults loaded a school bus with FFA students from Meeker High School. The group was heading to a competition at Colorado Northwest Community College, about 65 miles away. A heavy, wet snow was accumulating. Shults, a longtime volunteer for FFA, drove the school bus. The FFA team’s horse judging coach, Silvia Otabachian-Smith, followed the bus in her car. The caravan traveled just 7 miles when disaster struck. 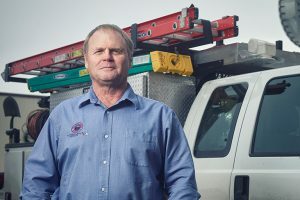 Out of the corner of his eye, Shults saw a flash of snow falling off a power line and then heard the sound of a wire coiling. From behind the bus, Otabachian-Smith witnessed several bursts of fire. The bus snagged a power line just as it was falling to the ground under the weight of the snow. “There’s an unmistakable sound, if you’ve ever heard wire unraveling from a roll,” Shults says. 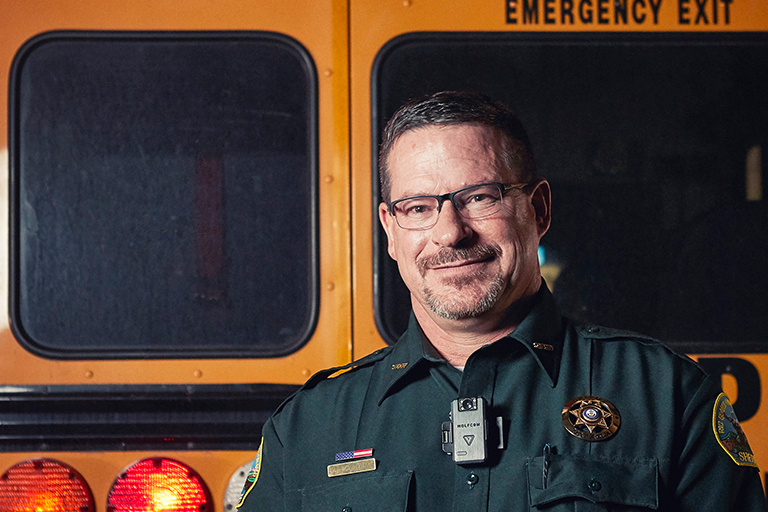 “The noise of us dragging the wire across the highway and just through the air … and then the strain of the wire as it became unraveled.” Rather than throwing on the brakes, Shults took his foot off the accelerator and let the bus coast to a stop. Amidst the chaos, Shults and his wife, who was also on the bus, kept the students calm and called 911 to notify dispatchers of the accident. Once Shults assessed the situation, his next concern was whether oncoming traffic could see them and stop in time, seeing as the bus signals shorted out. “Everybody did everything right,” Sheriff Anthony Mazzola says. John Purkey, line superintendent at White River Electric Association, and Sherriff Anthony Mazzola soon arrived on the scene. Sheriff Mazzola says, “John Purkey got out first. He needed to secure the scene.” He ensured that the lines were de-energized and untangled from the bus and that the scene was safe before first responders moved in. White River Electric regularly provides training to local first responders. “We knew from this training that you don’t approach a scene because there is such a thing as step voltage, that even though the wire is on the ground as you walk into that scene, you could be stepping into different voltage variations and injure yourself,” Sheriff Mazzola explains. 1. Remain calm and stay inside the vehicle. 3. Warn others to stay away from the vehicle. 4. Stay seated and do not exit the vehicle until utility personnel say it is ok to do so. 5. If you must exit the vehicle because it is on fire, jump clear of it with your feet together and without touching the vehicle and ground at the same time. Keeping your feet together, shuffle or “bunny hop” to safety. Frank Sampson of White River Electric emphasizes the importance of treating every downed power line as if it is live. Learn more and see the story at https://www.youtube.com/watch?v=-O6GjPiyQ5U.